Editorial – La Triennale di Milano 2016 : the story of a "rebirth"
EXPO, why and where ? EXPO 2017 Astana : "Future Energy"
EXPO 2017 Liège : "Connecting the World, linking People"
Newsletter 18 - The BIE celebrates its 80th Anniversary ! "On October 26th, 1912 a diplomatic convention was signed in Berlin..."
The Bureau International des Expositions, BIE, celebrates its 80th Anniversary ! MARCEL GALOPIN, author of "Les expositions internationales au XXème siècle et le BIE"
PATRICE BALLESTER, University of Pau, associated researcher at the Laboratory GEODE CNRS UMR 5602. MSM Toulouse. Newsletter 17 - Shanghai, closing of a great expo ! Newsletter 16 - Expo Shanghai in Live ! Nominees "BIE-Cosmos Prize, Expo Shanghai 2010 for Better City, Better Life"
Newsletter 15 - Expo Shanghai opens in 41 days ! 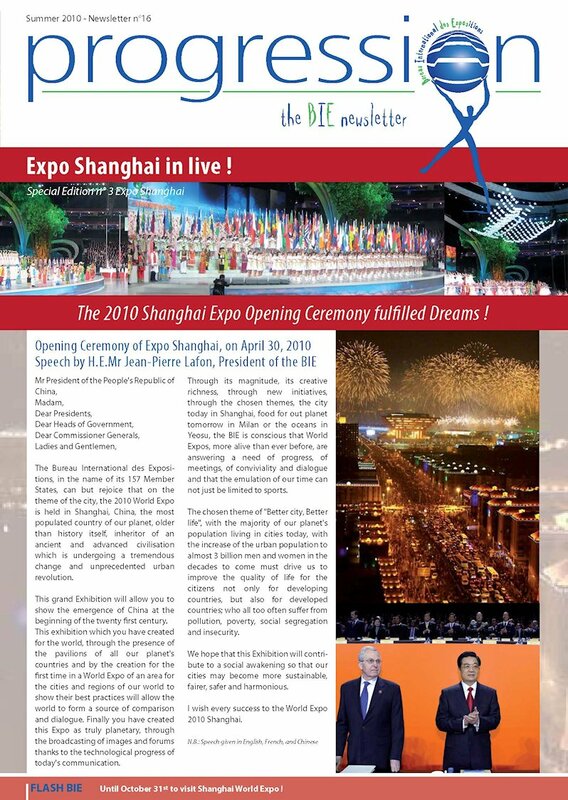 Newsletter 14 - 130 days until … Expo Shanghai 2010 !